Sensational colt The Autumn Sun (Redoute's Choice-Azmiyna by Galileo) has retired from racing and will join the Arrowfield Stud roster for the 2019 season. The Autumn Sun's owners Hermitage Thoroughbreds and Arrowfield met this week to consider the options for the five-time Group 1 winner. After extensive discussions, the opportunity to return the colt to his spiritual home and fill the gap left by the death of Redoute's Choice proved too compelling. Arrowfield's John Messara says, "We backed Redoute's Choice as a sire of sires early in his career, we stand Snitzel and Not A Single Doubt, and Beneteau was also highly successful for us. That history makes the best colt by Redoute's Choice an irresistible prospect." After his debut 2YO win over 1200 metres in Class record time, The Autumn Sun progressed rapidly to compile five Group 1 victories from 1400 to 2000 metres over a nine-month period, including the BRC JJ Atkins S. G1 at two. The only horse to win the Caulfield, Randwick & Rosehill Guineas, he retires to stud with 8 wins and $3.4 million prizemoney from nine starts. 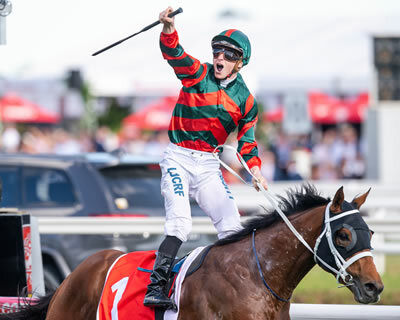 Arrowfield Stud suffered a devastating blow in the lead-up to the Inglis Easter Yearling Sale with the loss of Redoute’s Choice, but there will also be a sense of pride when they present a high-quality draft of his sons and daughters at the Riverside Stables next week. It will be the 17th consecutive occasion they have offered representatives of the multiple champion sire, who for so many years gave such outstanding service to John Messara’s famed Hunter Valley operation. Redoute’s Choice, who tragically died last week, carved out a remarkable record after his retirement to stud off the back of a distinguished racing career. Yourdeel (Dundeel) belied a below par gallop last week to lay claim to being New Zealand’s best juvenile after the gelding produced a barnstorming finish to take out the Manawatu Sires’ Produce Stakes (Gr 1, 1400m). Since the first foals by Redoute's Choice hit the ground in 2001, the champion stallion has to date produced 163 stakes winners, 34 of them at Group One level so here they are crop by crop. His current three year-old crop, which features five time Group One winner The Autumn Sun, numbered 99 live foals, while his current crop of two year-olds numbered 79 live foals. There were 69 yearlings born, 54 weanlings and he covered a small book of 45 mares last season so there is obviously going to be more to the story. Redoute's Choice. Photo: Mark Smith.